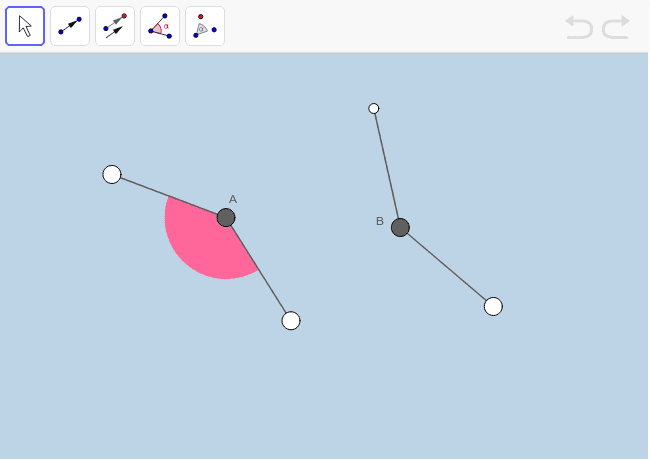 ﻿In the applet below, use the provided transformational geometry tools within the limited toolbar to visually prove that angle A IS CONGRUENT TO angle B. Then respond to the prompts below in your daily notebook. 1.7 A. Draw a diagram of the transformation(s) you performed in the applet to demonstrate that angle A is congruent to angle B. B. Explain how to prove that angle A is congruent to angle B. Refer to a precise definition of congruence in your explanation, and remember to clearly and completely state all transformations used in the proof.